the art show opening was a wonderful happening. i had never been to this gallery before and i was enormously impressed, not just with the art (which is excellent), but also with the gallery space itself and the lovely reception that the guild put on for artists, friends, family and art loving patrons. the atmosphere was warm, inviting and very friendly. i enjoyed seeing many exciting art pieces and meeting fellow artists friends. the talk that michael janis gave was quite interesting. always a pleasure to peek into the mind of an curator. and talking with michael afterward about how he views my work was quite gratifying. of course for neal and i the best part of the day was spending my opening with helena. 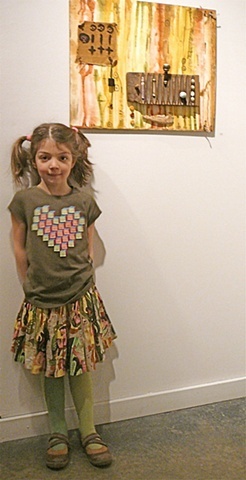 helena has attended my art show openings since she was a tiny baby. of course now it is great fun because she has many opinions on art and what she likes. it is fascinating for us to hear how she views the art and what appeals to her and why. how great is my bliss.....helena and an art show opening..ah life is fabulous!!!!! !